Here's my latest post for Backyard Poultry Magazine. Please feel free to leave a comment to enter the book giveaway. 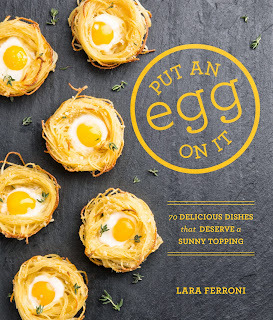 I recently had the pleasure of previewing a new cookbook by Lara Ferroni aptly named Put An Egg On It. With a flock of backyard chickens, a cookbook like this can certainly come in handy when you’re trying to find uses for all of your beautiful eggs. In a nutshell, I like this book. The pictures are beautiful and the recipes inspire you to go beyond the pale and add eggs to dishes you normally would not. In fairness, as a busy mom with after-school activities, sports, numerous pets and a flock of chickens, some of these recipes were a little too involved for me. And, with finicky eaters in my house, there would be tears at the table if I tried some of the more fancy feasts. But, what I liked the best, is that interspersed among fancy recipes, were easy recipes that appeal to palettes that think chicken nuggets are a delicacy. For instance, the grilled cheese and egg sandwich was a hit at my house as well as the hot dog with scrambled eggs and hot sauce. I’ve tried the breakfast bowl recipes and they are easy and yummy. I LOVED the introduction and egg basics sections of this book. For one, Ferroni’s pictures included not only white eggs, but green and brown too. Personally this more accurately reflects my egg selections. And two, the egg basics section is comprehensive and informative. Overall, this is a great book to have in your kitchen arsenal. The pictures and recipes are inspiring for those of us who are always looking for creative uses for our backyard eggs! We’re giving away a free copy of Put An Egg On It. For a chance to receive this book, please leave a comment on this post and/or at http://www.backyardpoultrymag.com/put-an-egg-on-it-cookbook-review/?blogger=pfreeman. If you leave a comment on both blogs, you’ll increase your chances of winning. Good luck! This is a great blog post written by Joel Salatin for the BackYard Chicken blog for Murray McMurray Hatchery. He makes some excellent points about the health benefits of raising backyard chickens, the segregation of today's food and farming systems and the way to get rid of commercialized chicken production.